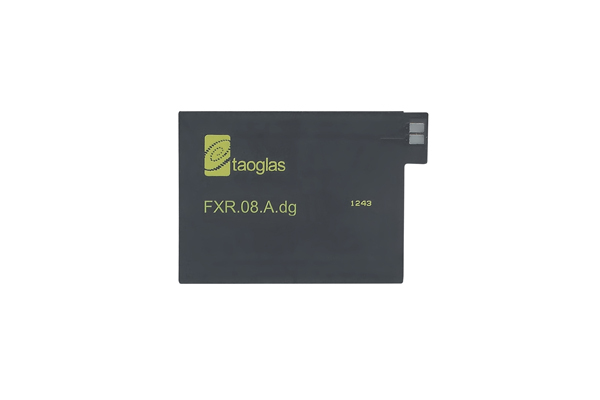 The FXR.08.A.dg is a rectangular, embedded, NFC (Near Field Communications) antenna for use in IoT devices such as keycards, payment systems, and readers. The design provides a flexible NFC antenna that can be adhered to metallic parts or directly to the battery of the device for ease of installation. NFC antennas can be applied in areas not traditionally available to other types of antennas. A common example is the ability to apply NFC antennas to batteries or other conductive surfaces. To enable this usage, however, a ferrite flux director layer is required. This ferrite layer acts to steer the magnetic flux away from the metal or other conductor, where it would otherwise result in loss or complete failure to communicate. Taoglas NFC antennas can therefore be customized with flux director layers to enable this flexibility in usage. The coil inductance noted below can help estimate a capacitance value for creating resonance at 13.56MHz.